Objectives The current video presents the nuances of the endoscopic endonasal transoculomotor triangle approach for the resection of a pituitary adenoma with extension into the ambient cistern. Design The video analyzes the presentation, preoperative workup and imaging, surgical steps and technical nuances of the surgery, the clinical outcome, and follow-up imaging. Setting The patient was treated by a skull base team consisting of a neurosurgeon and an ENT surgeon at a teaching academic institution. 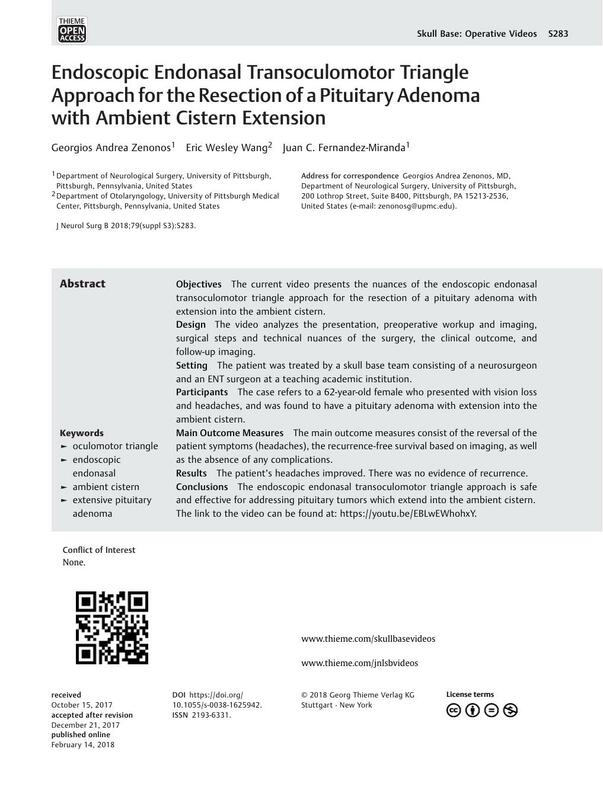 Participants The case refers to a 62-year-old female who presented with vision loss and headaches, and was found to have a pituitary adenoma with extension into the ambient cistern. Main Outcome Measures The main outcome measures consist of the reversal of the patient symptoms (headaches), the recurrence-free survival based on imaging, as well as the absence of any complications. Results The patient's headaches improved. There was no evidence of recurrence. Conclusions The endoscopic endonasal transoculomotor triangle approach is safe and effective for addressing pituitary tumors which extend into the ambient cistern. The link to the video can be found at: https://youtu.be/EBLwEWhohxY.